Non-critical tasks taking up too much of your time? Looking for a way to cut down overheads incurred with the traditional employment? Infognana offers virtual assistant services to save your precious time and cut costs so that you can concentrate on your core activities. Our virtual assistants are well trained to handle different levels of complexity and have wealth of skills and willingness to assist you with the administrative and technical tasks. 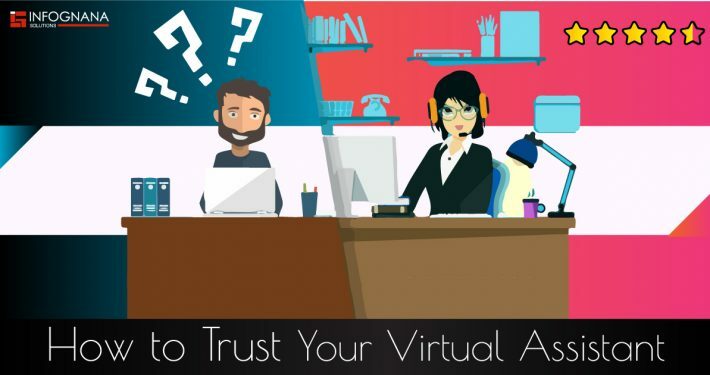 If your marketing endeavors are taking a backseat and hurting your growth potential, hire a virtual assistant to accelerate it. They will execute every aspect of your marketing strategy in the way you anticipated. From social media to digital advertising, entrust your marketing to our virtual sales assistants and gain the perfect exposure. Not on the list? Please contact us. In a business, there are many administrative tasks to be handled on a daily basis. In this regard, we can be your helping hand. Our virtual administrative assistant will assist you with mundane administrative activities involved in running your business successfully. Our virtual assistants will support you in every day-to-day task. We will allocate a virtual personal assistant entirely to you. It will facilitate direct communication with your personal virtual assistant 24/7. These services are simplified and flexible to meet your changing requirements. In the contemporary times, it has become imperative to promote your business through the leading social media platforms. It is an ongoing process that must be handled by the experts. Apart from promoting your business, our VA engages the customers and interacts with them. Data entry is the most tedious task for the businesses of all sizes. Business owners looking for data entry specialists will gain an extra edge from the expertise of our teams. It will relieve your talents to be used for other important tasks while your data will be effectively managed. A lot of creative is required for running the modern business. It includes designing of Infographics, websites, e-newsletters, and brochures. We design outstanding content and graphics that represent your company and work culture. Our virtual assistants can help you in managing the human resources department of your organization. It includes employee management, recruitment, onboarding, and corporate training. For every task handled by our teams, we uphold utmost responsibility. Our teams are proficient in their work and possess a profound experience to manage your tasks. We will enter into a comprehensive confidentiality agreement to offer you complete peace of mind. Infognana has served diverse industry verticals with our specialized services. We have gained expertise and profound experience in the field of virtual assistance with a team of professionals working diligently on every project. They work as your multi-skilled employees to supercharge your office environment without escalating the running costs.